Anytime I see the word, red, I think of blood. 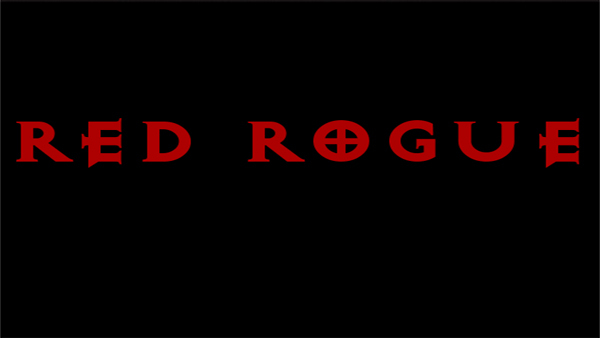 Anytime I see the word, rogue, I think of the roguelike genre of games. The game Red Rogue happens to be a roguelike game that has blood in it, so it turns out my intuition isn’t quite as warped as I thought it was. Because of this, I gave Red Rogue the old college try which like in my real university experience involved struggling with difficult obstacles, consuming strange things that might possibly kill me and hanging around with a skeleton bodyguard (so maybe it’s not exactly like college). As I mentioned earlier, Red Rogue is a roguelike which means that everything within the dungeon is randomly generated and when you die you die for good. With that in mind, this game probably won’t be for anyone that gets easily frustrated by the finality of death but I personally love how this genre makes you actually think about your actions. Anyway, Red Rogue is a side-scroller that’s light on the platforming and heavy on the atmosphere with a very hands off approach to combat. That may seem like a negative mark against it, but in the end it equates to a very streamlined game that’s quite enjoyable to play. Your character begins the game in a dungeon filled with monsters and traps, though this isn’t a journey that you’re forced to take alone. A helpful skeleton aids you in your quest by automatically attacking any enemies that get too close. You can also attack by simply pressing the directional key in the direction of your foe or hitting the F button if you have a throwable weapon equipped. 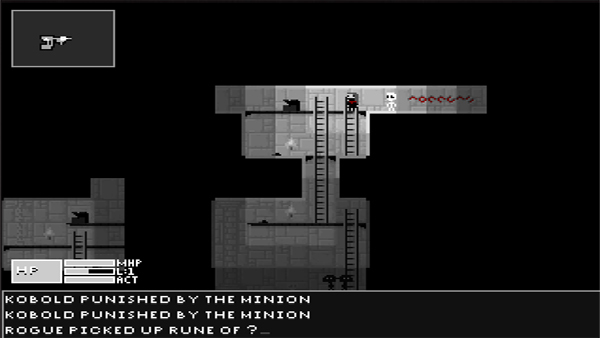 Along the way you pick up armor, weapons and other items that can be assigned to either you or your skeleton friend. These items can be enhanced by runestones that you find along the way though caution should be taken though as like most everything else have random effects. That’s part of the fun of these sorts of games, so experiment with all the flavors of the runestone rainbow and experience the good, the bad and the sudden case of bleeding. Ladders, decently lit hallways…this dungeon can’t be that bad. In addition to the monsters, which include kobolds that drop consumable hearts to top hat wearing trolls, the dungeon is also littered with a variety of traps which can be disarmed by pressing the “X” key. In one stage, I fell several floors through a hole that suddenly appeared, was teleported all the way across the dungeon and then shot with darts. It was fun, though probably painful for my little dungeon explorer. Your overall goal is to find an amulet at the bottom of the dungeon, though it’s important to keep your character properly leveled up (you’ll know this happens when lighting surrounds you and you float into the air) and well-armed as opposed to trotting for the exits as fast as you can. I learned this the hard way. I wouldn’t say Red Rogue is incredibly difficult as the control scheme is really quite simple and traversing the map doesn’t involve too much noggin’ scratching however it does take some patience. That being said, the roguelike elements are what make it the type of game that you’d want to continue chipping away at or replay again and again. Losing everything is always the best motivator and I know that from experience.